While Jon McCann made changes to the System Settings UI, I was busy implementing an animated notebook, to make the switch between panels, overview and search less jarring. 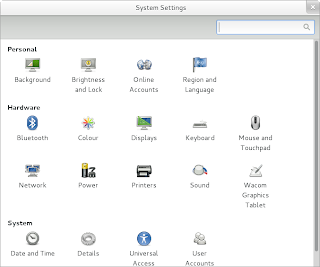 There will most likely be more tweaks of the UI between now and the GNOME 3.6 release, which I'll make sure to let you know about. PS: Before you ask, we cannot animate window size changes. Hopefully this will be possible in the future. Update: Fixed a double-negative. Also note that there are some differences between my screenshots and reality, like the separators, as my system wasn't fully updated. Is it possible to resize the window? That's currently my biggest peeve with System Settings or any other window that has this feature disabled. Is there any rationale for the decision to disable this feature? Henrique: yeah, this frustrates me as well, but only if the window should (meaning there are some sort of srollbars present) be resizable. Then the fact it is no resizable is a bug, IMHO. 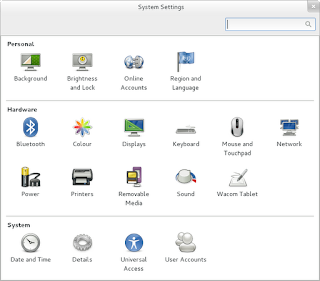 On the other hand the design of Gnome Control Center is such that you should never need to resize it should always fit all the icons so that there are no scrollbars - if I am not mistaken. Thanks Bastien, you're doing great polishing work there! You sir, rock. I was pointing this problem out before, finally someone fixes it. 3.6 will be awesome. Are all of these animations in GTK+? Or are they somehow specific to the System Settings? Would probably make sense to have stuff like that at the toolkit level so we can have inter-app consistency. I'm wondering why wacom tablet need their own entry even if none is connected!? 800x600 displays are well and all, but that doesn't help with the 800x480 display on my first-generation Asus EeePC (which otherwise runs Gnome 3 quite smoothly, actually). Can animated breadcrumbs be used as a way to make menus more easy to use and touch friendly? Why are you getting rid of the lovely grayish toolbar? Without it, the application looks so boring. Anyway, great work with those animations. Will it be possible to disable them in case of slow computer? I believe that for search results transiton is not necessary since these results are just reorganized overview according to search criterion. 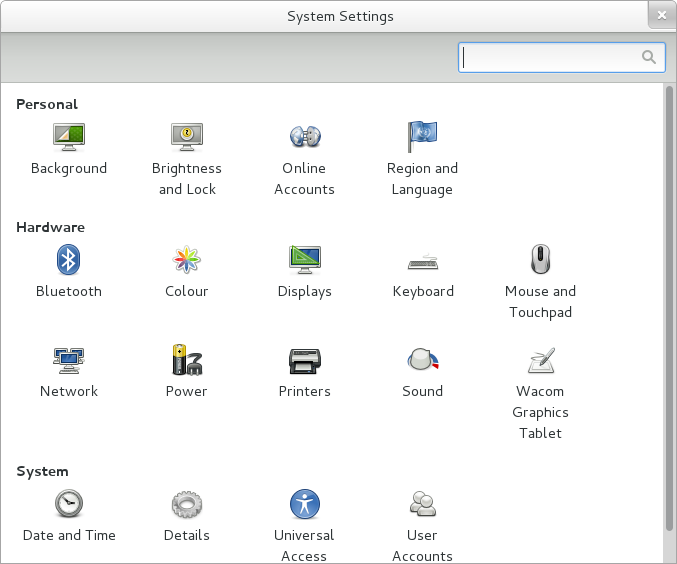 So, on some systems with extra panels in the "Hardware" section, "System" ends up scrolled off the bottom of the window. 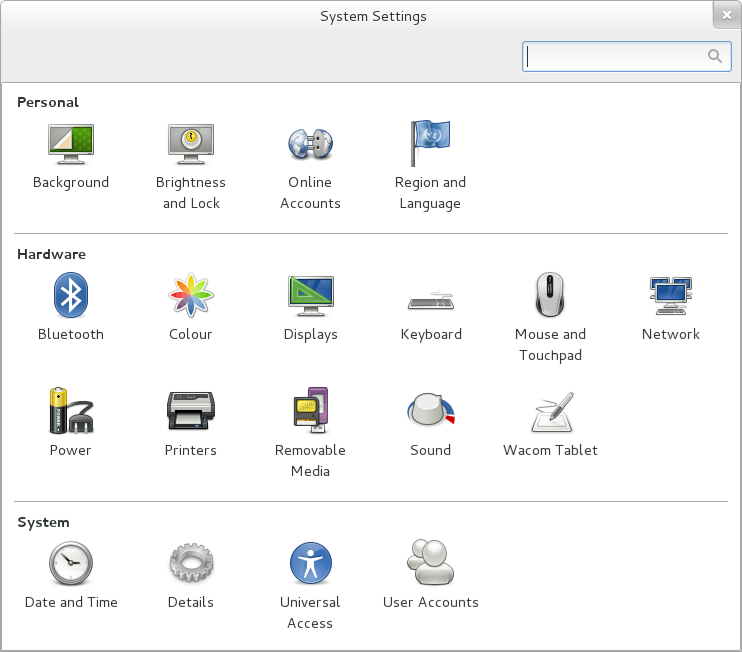 Why not put the "Hardware" section last, since "Personal" and "System" both should have a constant number of items? The layout fixes are a lot more appealing than the animations, which just look kind of last-decade tacky. There are useful places to put animations, but "right in the middle of the thing you're trying to use" isn't really one of them.